Not surprisingly, these took a bit of effort to produce, at least relative to one of their pamphlet comics. Marvel ran these monthly for about four years but never was able to find a viable business model for them. They were neat and different than anything any other company was doing at the time, but they were essentially loss leaders. Interestingly, while these CyberComics COULD have been used to direct readers to buy the printed ones, it was in fact the printed comics that were used more heavily to drive readers to the webcomics! Gambit #12 made direct reference to the the Gambit: The Hunt for the Tomorrow Stone CyberComic, and I recall quite a debate among the Marvel Chronology Project board of directors on how, or even if, we should handle presenting that new twist to continuity. Towards the end of Marvel's experiment with "CyberComics", they added another approach which, financially at least, seemed to make a little more sense. 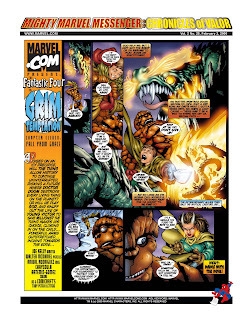 They added a page to their weekly "Marvel Messenger" newsletter devoted to an original comic story. These were treated more like regular comics -- no animations or sound or anything -- and were used to encourage people to get the PDF newsletter. Which itself was a promotional tool for Marvel's upcoming comics. Unlike the CyberComics, which were posted on Marvel's website, these were only available via the emailed newsletter. Like the CyberComics, though, these were dropped entirely in 2000. Although I don't think there are many people working at Marvel today who worked on any of these cybercomics, I continue to get the impression that their early not-great experiences there have colored the company's view on webcomics. "Marvel has long since removed them from their own site" is slightly an understatement. Five or six years back, when I was working on their Official Handbooks, Marvel simply no longer had these. Like many early internet materials, they'd simply been lost at some point in time. My professional archivist side hopes that people holding the originals will either pass copies along back to Marvel, or to some other place which can permanently archive them (Michigan State University's comics library jumps to mind as one of the better possibilities). I remember getting a free CD-ROM with Marvel's old fanzine "Marvel Vision". If I remember correctly, it was an old AOL promotional CD, which included a Spider-man webcomic on the CD, which you could read without being on the Internet. I remember it featured Spider-man and Doctor Strange, and had really cool artwork. I still have the CD somewhere... I am not sure of its location, but I still have it!